WHITE VS BROWN RICE- WHICH IS BETTER? What Type Of Protein Is Best for You? What is juicing? How is it different from cleansing and detoxing? What should I eat before and after working out? What supplements should women be taking? NO matter what I do….I cannot get a flat belly! Should I be sore after every work-out? 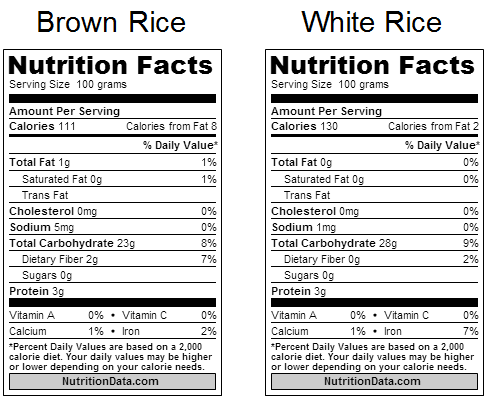 Home Uncategorized WHITE VS BROWN RICE- WHICH IS BETTER? Most of you have heard by now that brown rice is good and white rice is bad. I have even heard it and proclaimed it! As most of you know I spend a lot of time researching and trying to understand how nutrition and exercise affects our body. Recently, I have spent a lot of time researching it and have come to a conclusion….there are minimal differences. Depending on what your health and fitness goals and your lifestyle, will dictate which is more beneficial. Brown rice is essentially what almost all forms of white rice looks like before it has been put through a refining process. To process rice into what we buy in stores, the out-side hull and bran is removed. This makes rice lighter and faster to cook. Rice goes through the refining process, it has been stripped of its fiber, proteins, thiamine, calcium, magnesium and potassium. Have you noticed white rice is usually labeled as “enriched?” White rice is usually full of unnatural fortifications and additives. These fortifications are used because the stripping process removes most of the iron, vitamins, zinc and magnesium from the rice. In fact, white rice is so devoid of nutrients that it does not offer the minimum nutritional requirements of the FDA. For this reason, white rice must be chemically altered with vitamins and iron just so that it can be sold in supermarkets. 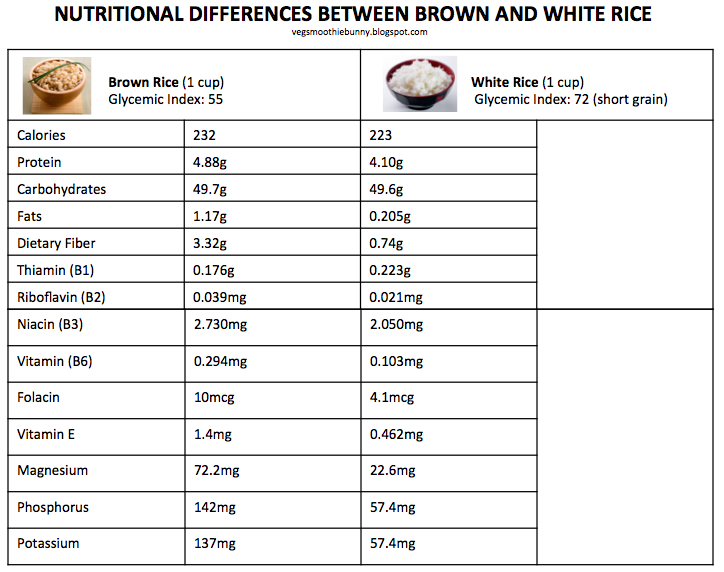 Most of us would look at this information and say clearly brown rice is better than white rice! Well, lets see about that…..
Foods can be classified by their GI(glycemic index) – which is based on how quickly a specific food causes blood sugar levels to rise. A higher GI food is digested more quickly, with a resultant high spike in blood sugar. Conversely, a lower GI food is digested more slowly and causes a less dramatic spike in blood sugar. Lower GI foods are believed to be the saviors which result in satiety, aid in fat loss and prevent disease (like type 2 diabetes). White rice is higher on the glycemic index than brown rice, which is why it is seen as a “bad guy” by comparison. That white rice is a higher GI food is indisputable, even when variables such as the specific varieties of the grain are introduced. A food’s GI score is assessed based on its effect on blood sugar when it is consumed by itself after fasting overnight. Just to make this clear, that means that a food’s effect on your blood sugar is only of great significance when it is eaten at the start of the day, without anything else, ie, a bowl of plain white rice for breakfast, which rarely happens. It’s more likely that there will already be other foods in your stomach, the presence of which will slow the digestion of, and subsequent spike in blood sugar caused by, white rice. Other macronutrients effectively lower the glycemic index of a whole meal, at which point there is no significant GI-based difference between brown and white rice. For example: Eating white rice, vegetables cooked with olive oil and a piece of turkey breast combines the three macronutrients – carbs, fat and protein – in a manner that results in a lower GI than even a bowl of brown rice alone. As you can see in the two examples above, there is little difference between the two as it relates to macro nutrients. The biggest difference is the micronutrients. Check this out….in brown rice there nutrients called phyates which act as anti-nutrients, actually decreasing the bioavailability of the micronutrients inherent in the hull. Think of it like taking vitamins, you know your body is not absorbing all of what the label says , all of the time, because it just can’t. Certain variables like…how much of a specific vitamin is in your system already, other micronutrients that stop or slow absorption and your bodies overall efficiency of conversion. After adjusting for age and other lifestyle and dietary risk factors, people who consumed five or more servings of white rice per week had a 17% increased risk of diabetes, compared to people who ate less than one serving per month. But eating two or more servings of brown rice per week was associated with an 11% reduced risk of developing type 2 diabetes, compared to eating less than one serving of brown rice per month. As you can see, if you have type 2 diabetes, are significantly overweight or have a family history of diabetes, it is best to stay away from rice altogether. But if you have to have it every now and then it is best to choose brown rice in this scenario. Rice is a staple food when it comes to bodybuilding and intense workouts, but white and brown rice have different benefits. It can give you the sufficient energy needed for pre/post workouts. Both are great sources of carbs and have a relatively high GI, but white rice causes more of an insulin spike due to its very low fiber and fat content. Brown rice also increases insulin release, but the fiber and fats help reduce this. Therefore, at times of the day when you are not training, the carbs from brown rice are much less likely to go to body-fat storage than those from white rice. Brown rice can be the better option at most times of the day because the carbs it contains are less likely to be stored as body fat compared with those found in white rice. If you prefer white rice, then eating a food rich in fiber(like beans) with your meal will help reduce the undesired insulin impact of white rice and increase the length of time it takes to digest your meal, great for when you’re trying to cut body fat on a moderate-carb diet. At the end of the day, based on what we have discussed and studies I have read, the differences are miniscule. I love rice, but there are certain times of the day or my activity level(example: pre/post-workout) that will drive my decision when it comes to white vs brown. Those prone to type 2 diabetes should try and stay away from white or brown rice altogether! If that is too complicated and unrealistic, then just choose the one that tastes best and remember it’s never the best carb to choose overall, but most of us eat it so its worth the discussion and making a conscience decision.